The Mystery of History is our favorite history curriculum, hands-down (and we've tried quite a few). 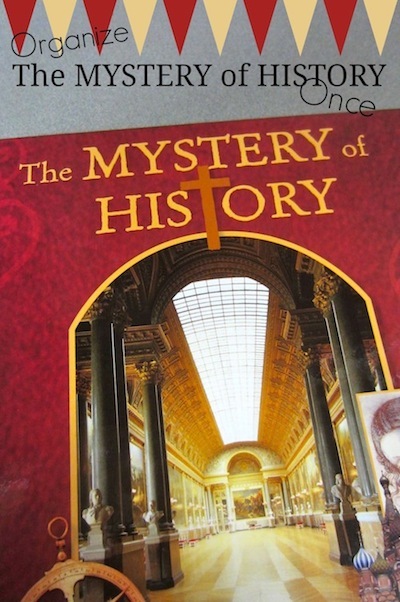 Divided into a 4-year cycle, The Mystery of History is designed to be used by multiple ages, which means that when your 1st grader studies Volume 1 in 1st grade, he'll also study it again in 5th grade. How does that work? Four years later, your student has likely forgotten a lot (most?) of the information she studied as a 1st grader. What you required of that little squirt way back then - coloring pages, a few sentences of copywork, a listening ear - now becomes full notebooking pages, mapwork, and a more practiced listening ear. Who of us in traditional schools got to study world history three times by high school graduation? It's fantastic. Today is the first of a two-part video tutorial series that helps you organize The Mystery of History once, so that you're all ready to go again in 4 years without having to plan that volume all over again. I have a semi-complete spreadsheet of Volume IV for you. Feel free to adjust it however you need, or check back in a few weeks when I have it completed! Find How to Organize The Mystery of History Once, Part Two here.